I’m not sure if I can come up with a more touching country music story in 2012 than that of Don Maddox. Think about it, 90-year-old man whose spent the last 54 years in virtual obscurity from the music world makes headlines by receiving standing ovations at the Grand Ole Opry and is featured at the Country Music Hall of Fame along with the rest of his family as part of the Bakersfield Sound exhibit. 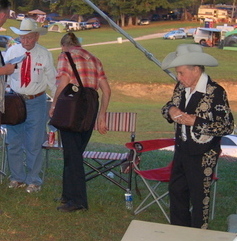 The last surviving member of the Maddox Brothers and Rose has been paling around with Merle Haggard, Marty Stuart, and “Little” Jimmy Dickens while being one of the headliners of the Muddy Roots Festival in Cookeville, TN over Labor Day weekend. As the fiddle player and comedian “Don Juan” (his stage name), his brothers and sister Rose were seminal in creating not only the sounds of country music, but rockabilly and rock n’ roll as well. 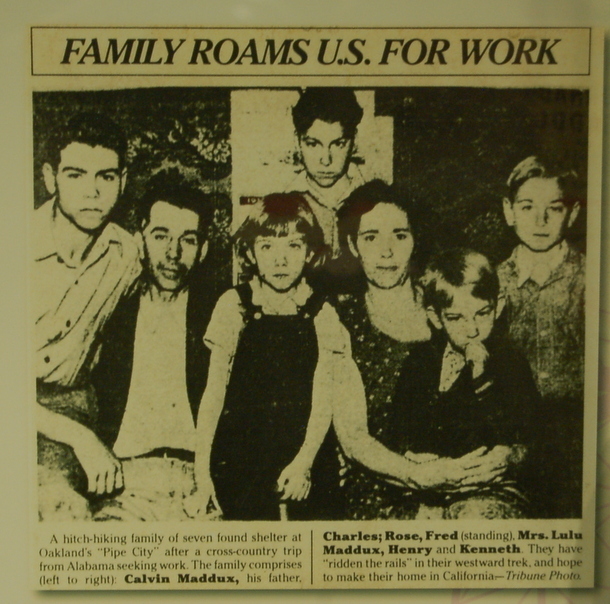 As Depression-era refugees, they moved from Alabama to California when the siblings were still young, and sick of trying to make it as laborers, decided to form a band that is mentioned by people like Merle Haggard as one of the most important and influential bands during the 30’s through the 50’s. Unlike other bands of that time, the Maddox Brothers and Rose mixed boogie woogie in with hillbilly music, making them one of the first rockabilly bands. 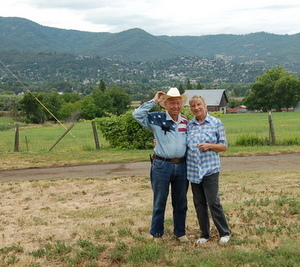 Earlier in the summer I spent a day at the Maddox Revolution Ranch in Ashland, OR with Don and his wife Barbara as part of writing a feature on country’s “oldest, newest singing sensation” (as Don like to call himself), and here is the full content of my hour-long interview with him. In the interview he talks about how Maddox Brothers and Rose may have influenced the style of Elvis, his adventures surrounding the Bakersfield Sound exhibit at the Country Music Hall of Fame, and how he became a rancher and the pillar of the Maddox family post-music. It is much more entertaining to listen to because Don is such a funny, entertaining guy, but I have also transcribed the meat of the conversation below, and included some interesting pictures. Download or listen with media player. Trigger: So you were born on December 7th, 1922. Don Maddox: There was two disasters happened on December 7th. One was Pearl Harbor, and I was born (laughing). Trigger: Lately you’ve had a resurgence in your career. You played the Muddy Roots Festival last year out in Cookeville, TN. And then this year, the Country Music Hall of Fame opened up a brand new exhibit highlighting the Bakersfield Sound and California Country, which the Maddox Brothers and Rose were seminal to. Don Maddox: And besides that, while I was back there (Nashville) for the Bakersfield country music exhibit, I was on the Grand Ole Opry! Who ever thought I’d be on the Grand Ole Opry? I didn’t. Trigger: Were you on the Grand Ole Opry originally with the Maddox Brothers and Rose? Don Maddox: No. We started recording in 1946, and then in 1947 we got a guest spot on the Grand Ole Opry, and then in 1949 we had a guest spot on the Grand Ole Opry. But this time I was on the Grand Ole Opry in my own name right as Don Maddox with Marty Stuart, and I got a standing ovation! I didn’t think anybody had ever heard of the Maddox Brothers and Rose. It blew my mind. Trigger: It’s because there’s been a resurgence in The Maddox Brothers and Rose and when you go back and listen to the music it makes sense because it’s timeless. It’s so important to so many different elements of American music. It’s easy to pigeon hole you into country music. But when you started off, you didn’t call yourself country music, did you? Don Maddox: Three of my brothers and Rose started before I came along. I was only about 13 at that time; 1935 or so. And then about 1940, I joined the band. At that time, it wasn’t called country or Western, it was called hillbilly music. And then about 1950 or something, hillbilly wasn’t going over too well, that’s when the pop artists came in. And now, the so-called hillbilly country music has transformed into pop country. But when we were hot it was just straight hillbilly music. Then rockabilly came in about 1950. I hear that Maddox Brothers and Rose were instrumental in creating the rockabilly sound. I didn’t know we were, but I did a song on the stage at that time, I was spoofing rockabilly. I did Ray Charles’ song “I’ve Got A Woman” except I parodied it and changed it into a comedy thing called “The Death of Rock & Roll”. It never got played here much in the United States, but I hear it was a big hit in Europe. Trigger: So you were big in creating rockabilly because unlike some other hillbilly bands, you would add some elements of boogie woogie in there. It wasn’t even called rock & roll at that point, it was called boogie woogie, and mixing the two was rockabilly. And your brother Fred was one of the first guys to create the slap style of playing bass. Don Maddox: The reason he did a slap bass is because he didn’t know how to play the bass, and all he was doing was playing rhythm anyhow, but he didn’t know the notes so he’d just slap the bass for the rhythm part and everybody thought he put on a great show and thought he was the best bass player there was. 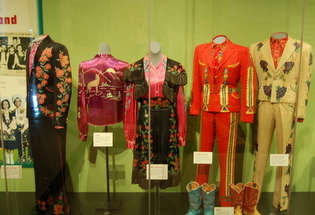 Maddox Brothers & Rose Display at Bakersfield Sound Exhibit; Country Music HOF. Trigger: Tell me about the experience of going out to this new Country Music Hall of Fame exhibit. I read a quote from Merle Haggard saying that if you don’t have The Maddox Brothers as part of this exhibit, then you may as well not have it, or something like that. How did it feel to be out there and realize just how much influence y’all had to the formation of American music? Don Maddox: Speaking of Merle Haggard, I’ve read his autobiography, and the first time he saw the Maddox Brothers and Rose he was only about 12-years-old, and we were playing at a dance in Bakersfield, CA. Somebody told him we had the best guitar player in the world, and he (Merle) wanted to be a guitar player. The guitar player we had was Roy Nichols. Merle went down there to see Roy Nichols but he happened to see us too. We got to know him better in later years, and Fred and Rose worked with him after Maddox Brothers and Rose broke up. But I’ve been out of the entertainment business for 50 years. I’ve been hibernating here in Ashland (Oregon), and nobody here either knew or cared that I was Don Maddox of the Maddox Brothers and Rose. Well we flew back (to Nashville for the HOF opening), got me on the Grand Ole Opry, and the guy that met us at the airport was from the Hall of Fame, and the first words he says to me was, “Did you hear what Merle Haggard said about you?” And I said, “No.” and he said that Merle Haggard said, “If you don’t get Don Maddox back here for this exhibit, you might as well not have it at all.” And then every person that I saw that was associated with the museum after that would say, “Did you hear what Merle Haggard said about you?” It just blowed my mind, I couldn’t believe it. 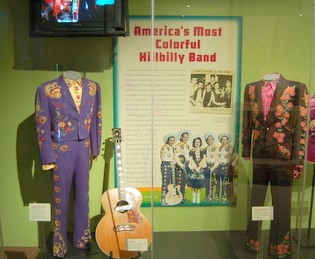 Trigger: So at the Country Music Hall of Fame, they have a whole section dedicated to The Maddox Brothers and Rose as part of the Bakersfield Sound exhibit. Don Maddox: They’ve got a whole exhibit, showing our uniforms and pictures. They’ve got Cal’s guitar in there. Marty Stuart, he owns all of the Maddox Brothers and Rose’s colorful uniforms that we wore because he collects uniforms like that. He was out here playing a fair last year, and I had a couple of boots I made special for me in 1950, and I had wore them out. They cost $50 a pair. They were 60-years-old at this time and I sold them to him for $100 a pair, and when I went back for the exhibit, there were my boots sitting out there right in front. Trigger: I just learned something about your role in the band. I knew you played the fiddle, but you say you were the comedian in the band which makes perfect sense. When I saw you perform live, and just sitting down here, you’re a very funny guy. So that was part of your role in the band, you we’re the comedian. How did that come about? Don Maddox: Well I’m shy and introverted (laughing). And when you read about other comedians, they’ll say they’re shy and introverted, unless they’re “turned on.” But I am shy and introverted, and that’s the only way I could get attention was to make the people laugh, and over a period of time of doing that, I got pretty good at it. Trigger: I heard that Elvis opened for y’all back in the day. Trigger: And when you say “Mama” are you taking about Rose? Don Maddox: No, I’m talking about the mother. Mother was the ram rod of The Maddox Brothers and Rose. She was the one that kept us together, and she was the boss, we were just the kids. We were just a family, and no matter how old we got, we were still just the kids. I was 37-years-old when I was forced out on my own when Mama, Rose, and Cal went back to Nashville. They left me sitting there on my own, I’d never done anything for myself in my life. 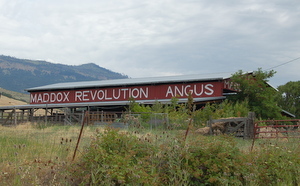 Trigger: In Ashland, OR, you have a barn that says, “Maddox Revolutionary Angus” on your ranch. It’s such a bold statement to call your angus “revolutionary.” What brought you to Ashland? How did you end up a rancher? Don Maddox: The band broke up in 1955. We had reached a plateau. The only income we had was from personal appearances, and we had played so many places so many times, the crowds began to taper off. And Rose decided she was actually the star, and she decided she could make as much money as the whole band got and had to split it 5 ways. So she decided to take off on her own, and she got in touch with Nashville and The Grand Ole Opry with just her and my brother (Cal) going with her to play guitar. And they left me, and my brothers Fred in Henry sitting there in Hollywood, and none of us was good enough to play with another band. We were good enough for Maddox Brothers and Rose, but not good enough to play with other bands. So there I was sitting there in Hollywood with all the money going out and none of it coming in, and I had always wanted to be a cowboy, a range rider. I didn’t know anything about cows or anything like that, so they had a college of agriculture in the San Fernando Valley, and I only lived 10 miles from that. So I decided I would enroll in that college of agriculture and get some book learning. I never even went to high school, much less got a diploma. I was 37-years-old at this time. After I had my goal set, which is where I’m at, sitting here on the ranch in Ashland, OR, all the ways and means just presented themselves. I was looking in trade magazines for cattle and a ranch and I saw one advertised in Ashland, OR for $35,000. 300-acres, some irrigated, with a house on it. Actually I wanted to go to the Napa Valley, but there was nothing there I could afford. I’d just bought me a 1957 pink Cadillac and I’d driven it up here. I didn’t have much use for a pink Cadillac on a ranch, I needed a pickup truck. So I tried to trade him my pink Cadillac as a down payment on the place, but he didn’t have any use for a pink Cadillac either, but he said he would knock off the real estate commission, and I could have it for $27,500. That was a lot of money at that time, but you couldn’t buy an acre of this land now for $100,000. So here I am, I’ve been working the place for 54 years, and nobody recognized me as a famous country music singer until now. Trigger: Is this still a working ranch? Don Maddox: Yes. I sold my cattle and I’m leasing the ranch out now, but I’ve been working the ranch up until now, but I’m getting to where I can’t do the work. Trigger: But now the music is coming back. Don Maddox: This is my golden years. I heard about the golden years when I was a younger man and thought, “Yeah right.” But since I’ve been in the golden years, I’ve got a new thing of my own, I’ve been on the Grand Ole Opry as myself, I’m in the Hall of Fame back there. This is the golden years for me. And how I got the Revolution thing, when I went into the cattle business I was raising registered Angus cattle. 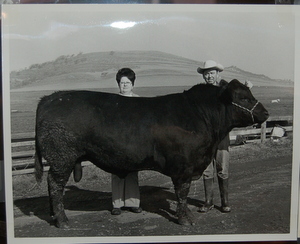 So I went to a bull sale in Reno and bought the grand champion bull up there, about 1970. They had this bull that I really wanted, and his name was Ben Bond Revolution #73. I waited until everyone had stopped bidding, and then I started bidding, and there was a guy who wanted him as bad as I did. I bid him up to $10,000 and he wouldn’t bid more than that because $10,000 was his limit. I latched on to that “Revolution” and I was gonna revolutionize the cattle industry with that “Revolution” bull, and I named my ranch “Maddox Revolution Angus Ranch.” And I kept that bull for two years and he gave me some good calves, and then he went sterile on me! And I had to sell him at hamburger prices at 25 cents a pound. So I didn’t revolutionize the cattle industry because nobody would join my revolution. Trigger: Rose lived in Ashland too, so Ashland kind of became the home of Maddox Brothers and Rose post your heyday. We’re you the one that brought the family up here? Don Maddox: Well I bought the ranch, and Rose and Cal had gone back to Nashville for a year, and things didn’t work out for them in Nashville. So I sold them 5 acres of my ranch, and they built a house there. So Mama (mother Maddox), Rose, and Cal lived there together all their lives. Rose’s son, he had a family, and when mom and Cal died, Rose’s son and his wife and kids moved in with Rose and wrecked the house and all of that good stuff. Then Rose was in bad health and fell on bad financial circumstances. She borrowed some money on the house and couldn’t pay it back. So in order to help her out, I bought the house from her, and then I gave her a lifetime estate so she could live there the rest of her life like she owned the place. And then my brother Henry, he went out on his own to play music, and he couldn’t make it on his own, so he moved up here then. And then he got kidney failure, and he was broke so he moved in there in the house with Rose. Trigger: So you became the rock of the Maddox Brothers and Rose family. You’re the one that took the last little bit of wealth that you had from the Maddox Brothers and Rose experience and invested it in this cattle ranch, and you kind of became the pillar of the family. You helped support them over time. This ranch supported the Maddox Brothers and Rose, and it still does. 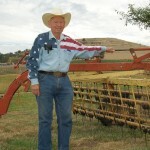 Don Maddox: Well, when I bought the ranch, I bought it to raise cattle on. I wanted to be a cowboy. But the fringe benefits of owning the ranch have made me a wealthy person today. What a wonderful interview! Thank you. It was so nice to see Mr. Maddox at Muddy Roots again this year. Not only did he stay for many of the performances, he shared kind words with the artists that made their experience that much more memorable. We are so very lucky to have him with us. And what a story! He has quite a mind for business, as I can only imagine what he absorbed as one of the innovators of what we know as Country Music. One question, where can I buy his new CDs? Great interview! Any info on where to get his music? Sorry folks, I’m working on getting the info on how people can purchase Don’s music. As soon as I have it I will post it here. As someone who loves history, I consider this interview priceless. Thank you very much for recording such an important piece of living history and paying due respect to such an essential figure in the history of music. It was truly informative, not to mention extremely entertaining, to listen to this. About two weeks ago, I was heading from the Seattle area to California and while driving through Ashland I noticed the Maddox Revolution Angus barn right beside I-5. I have passed by the place more times than I can count, but this was the first time I actually understood its significance, thanks to your articles on Don Maddox. On a side note, Don Maddox seems to have more of a Southern accent than you, despite the fact that he has lived in the West Coast for about 8 decades (almost all of his life thus far). I guess he has had to try pretty hard through all of that time to maintain his twang. Aww this is my uncle! I haven’t seen him since his first wife (my aunt nan) died! I would like to know if the Maddox Family own the rights to the song Chocolate Ice Cream Cone that was written by Rose Maddox.